Keen to the company's vision to produce home products that are affordable yet easy to use, all-sun is proud to introduce its good product, the all-sun Non-contact Voltage Tester & GFCI outlet tester kit. Sure the professional works of a skilled electrician in your town can never be replaced by any machines, but this safty kit is sure to give aid to professional electricians and handymen alike who are fond in do-it-yourself projects. 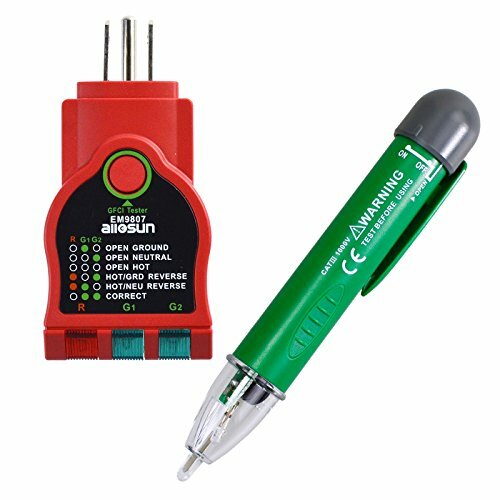 The all-sun Voltage Tester Pen GK7 accurately detects AC voltage ranging from 70-1000V giving this voltage tester a very precise range for day-to-day use. It has also been designed to be a non-contact voltage tester, meaning you don't have to make the device touch the live wire just to get results. It is a safe yet accurate means of testing whether voltage runs across the line in question. The socket tester can be used to detect faulty wiring in 3-wire receptacles. Model EM9807 is a GFCI receptacle tester so that it can also be used to examine GFCI for proper operation. They are ideal for use on 100 to 125V AC receptacles. True to its promise, a responsive customer care team that is always in standby for any issues about your order. Indispensable tool- Absolutely essential for electrical, remodeling, and/or home improvement projects!